Are you tired of the same old, same old breakfast? If so, you have got to try out this cheesy ham and hash brown casserole recipe which is delicious and every easy to make! I have made their recipe a few times now and I use whatever kind of shredded cheese I have on hand. Sometimes I have used cheddar cheese, American cheese, Mozzarella and/or Colby Jack...it was equally as good! My entire family loves this recipe, including my little 5 year old grand daughter. 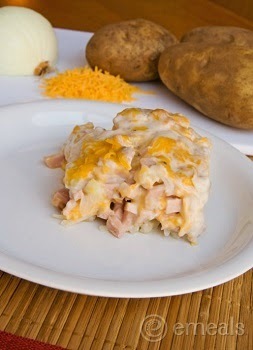 Layer half of potatoes in an 8x8” baking dish or 2-quart casserole dish coated with cooking spray. Top with half of onion, half of ham, and half of cheese. Repeat layers. In a large bowl, whisk together milk, egg, salt, and pepper; pour over casserole. Cover dish with foil, and bake for 1 hour. Remove foil and bake 5 more minutes, or until top is browned & bubbly. Let stand 10 minutes before serving. Disclosure: This recipe and photo is courtesy of eMeals.